iRealHousewives | The 411 On American + International Real Housewives: Vicki Gunvalson Denies Claims In Fraud Lawsuit Filed By 82-Year-Old Woman! According to court documents obtained by The Blast, Vicki Gunvalson is being accused of lying to Joan Lile for more than 20 years. The 82-year-old woman reportedly filed a case against the Real Housewives of Orange County star and her company, Coto Insurance and Financial Services, for fraud, breach of fiduciary duty, negligence, intentional infliction of emotional distress and breach of contract. The outlet reported that Lile bought a longterm care insurance policy from Gunvalson in 1996. The customer reportedly claimed that the Bravo reality star assured her and her husband that the agreement would cover future medical premiums after one of the spouses died. However, Lile reportedly alleged that Gunvalson lied about the “Lifetime Waiver of All Premiums of a Surviving Spouse” clause, all while “preying on the confidence and trust” of the couple. According to The Blast, the documents claim that Gunvalson fraudulently and intentionally misrepresented what she sold her customer. Meanwhile, “[Lile] paid ever-increasing premiums yet was ultimately denied the specific benefit on which the purchase of the policy was predicated,” reports Us Weekly. Court documents reportedly state that the benefit “was of the utmost importance to the Liles because Robert Lile was significantly older than Joan Lile and wanted, above all else, to know that his wife would be protected financially upon his passing” in 2017. 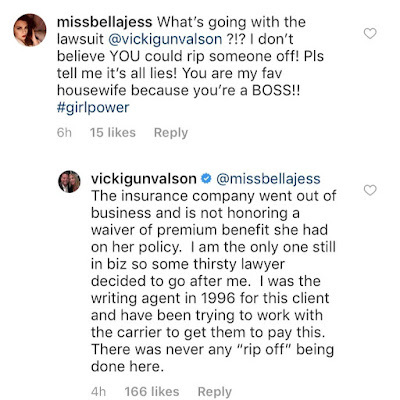 Gunvalson also took to social media to deny these claims. 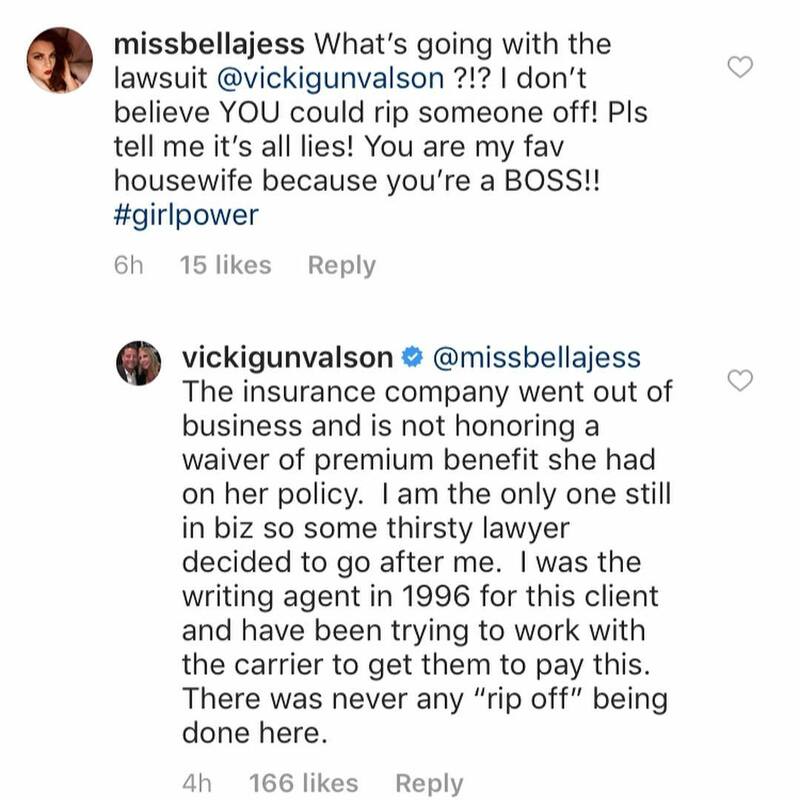 When asked to address the lawsuit, Gunvalson replied; "The insurance company went out of business and is not honoring a waiver of premium benefits she had on her policy. I am the only one still in the biz so some thirst lawyer decided to go after me," she wrote in the comment section in one of her recent Instagram posts. "I was the writing agent in 1996 for this client and have been trying to work with the carrier to get them to pay this. There was never any "rip off" being done here." Later the OG of the OC took to Twitter to share more light on the legal situation. She tweeted: "It would be nice for the press and plaintiff's attorney to accurately release the truth. See below." 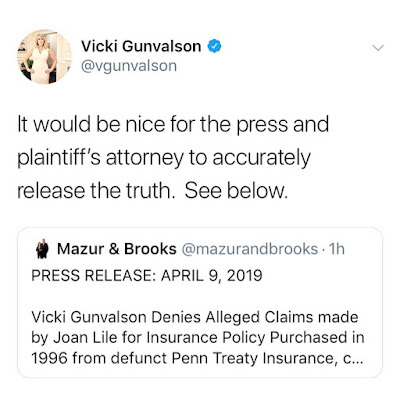 Gunvalson included a press release document on her tweet, which is dated on April 9, 2019. 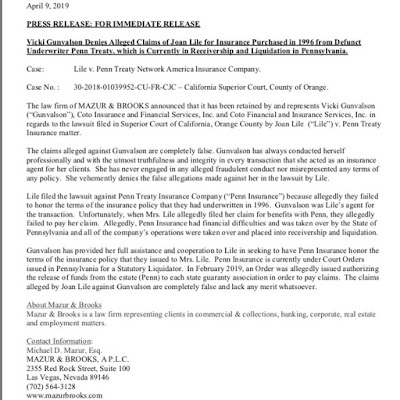 The press release courtesy via Mazur & Brooks reads as follows: "The law firm of MAZUR & BROOKS announced that it has been retained by and represents Vicki Gunvalson (“Gunvalson”), Coto Insurance and Financial Services, Inc. and Coto Financial and Insurance Services, Inc. in regards to the lawsuit filed in Superior Court of California, Orange County by Joan Lile (“Lile”) v. Penn Treaty Insurance matter. professionally and with the utmost truthfulness and integrity in every transaction that she acted as an insurance agent for her clients. She has never engaged in any alleged fraudulent conduct nor misrepresented any terms of any policy. She vehemently denies the false allegations made against her in the lawsuit by Lile. 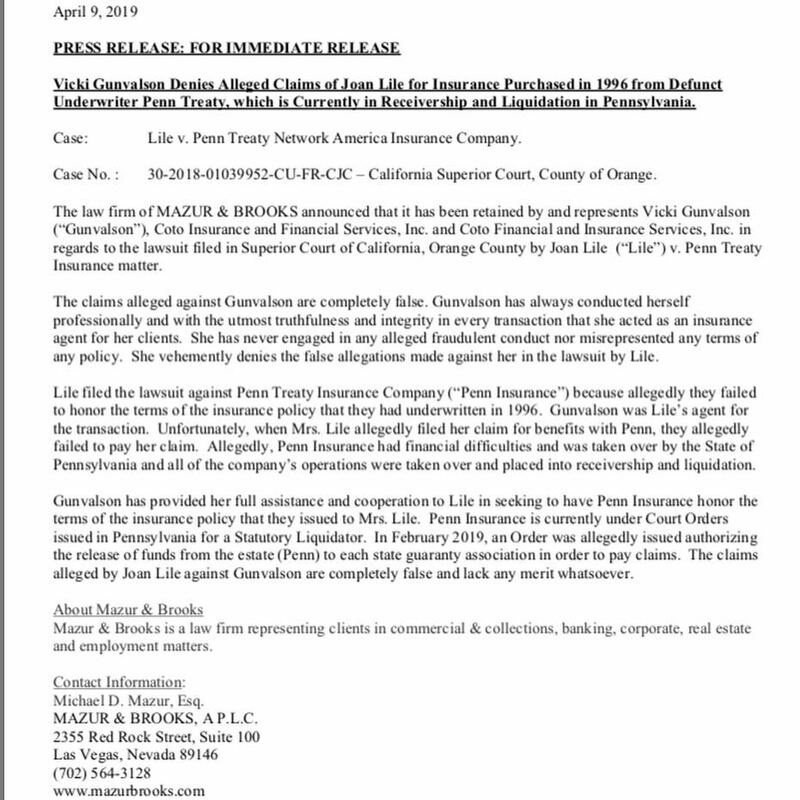 Lile filed the lawsuit against Penn Treaty Insurance Company (“Penn Insurance”) because allegedly they failed to honor the terms of the insurance policy that they had underwritten in 1996. Gunvalson was Lile’s agent for the transaction. Unfortunately, when Mrs. Lile allegedly filed her claim for benefits with Penn, they allegedly failed to pay her claim. Allegedly, Penn Insurance had financial difficulties and was taken over by the State of Pennsylvania and all of the company’s operations were taken over and placed into receivership and liquidation. Gunvalson has provided her full assistance and cooperation to Lile in seeking to have Penn Insurance honor the terms of the insurance policy that they issued to Mrs. Lile. Penn Insurance is currently under Court Orders issued in Pennsylvania for a Statutory Liquidator. In February 2019, an Order was allegedly issued authorizing the release of funds from the estate (Penn) to each state guaranty association in order to pay claims. 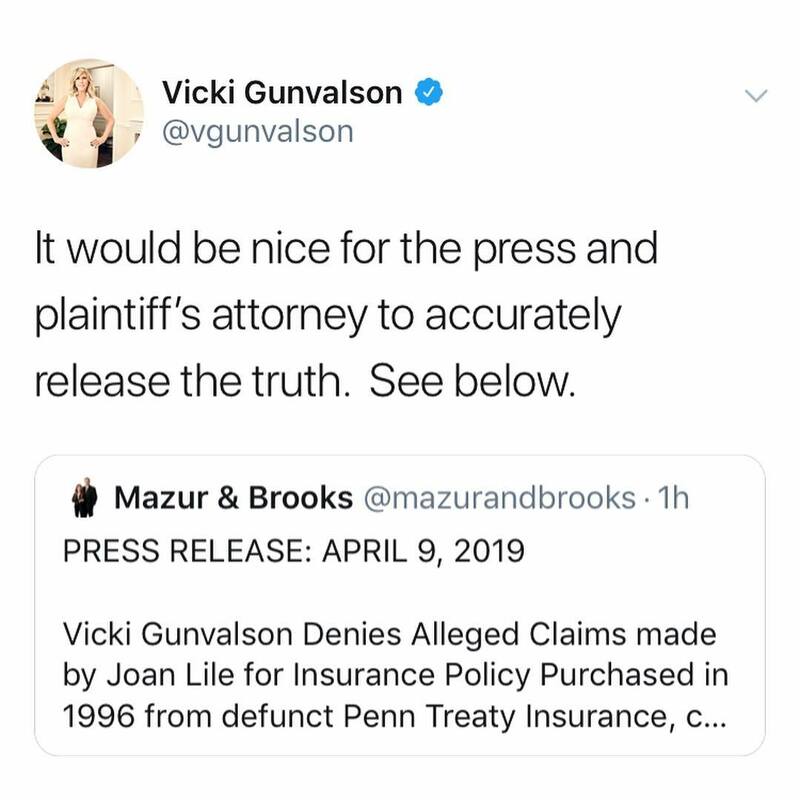 The claims alleged by Joan Lile against Gunvalson are completely false and lack any merit whatsoever."